Size 6 Dora The Explorer Nightie. 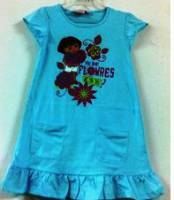 Great for fans of Dora, your child will adore this short sleeve nightdress. Made from a pretty light blue material, featuring a Dora puff paint print. The soft and comfortable material will allow your little one to sleep and move freely at bedtime. These Dora the Explorer Pyjamas are also available in Size 4, Size 8, and Size 10.